If Hannah Saltzman looks familiar to anyone in the Clarksville area that may be because she has worked for 5 years as a courtesy clerk and bagger at the neighborhood Giant Food. Hannah loved her job at Giant but dreamed working as an administrative assistant in an office environment. 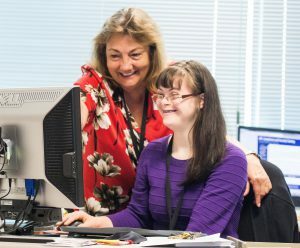 With the full support of her family and Employment Specialist at The Arc, Barbara Moyer, Hannah started taking steps to reach her goal by training on various clerical skills. Hannah volunteered her time to help collate binders and make photocopies at The Arc’s office, where she also trained as a receptionist at the front desk. When opportunities for employment at the Johns Hopkins Applied Physics Laboratory became available, Hannah was eager to apply. Encouraged by Amit Patel, the head of APL’s Diversity Office, Hannah began the application process and participated in a series of interviews. Ultimately she was hired as a part-time administrative assistant at APL. 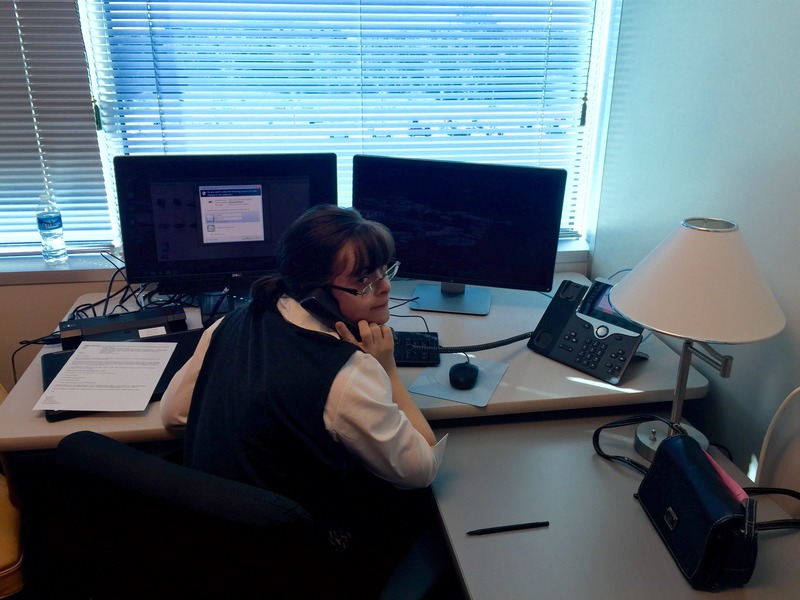 Hannah loves her new position and is busy learning her job in her beautiful office. Her supervisor, Patti Higgs, says that “Hannah is fast to learn a new task and has a wonderful attitude” at work. To make this an even better experience for Hannah, she has been able to keep some shifts at Giant. This combination of interacting with the customers at Giant, while continuing to grow professionally at APL, is a true example of community partnerships that work to help each person reach their personal goals to be a productive and happy member of their communities. Congratulations to Hannah and a special thank you to everyone who helped to make these dreams a reality for her!